Fine details of the dark band are revealed in this image of the central portion of M64 obtained with the Hubble Space Telescope. M64 is well known among amateur astronomers because of its appearance in small telescopes. It was first cataloged in the 18th century by the French astronomer Messier. 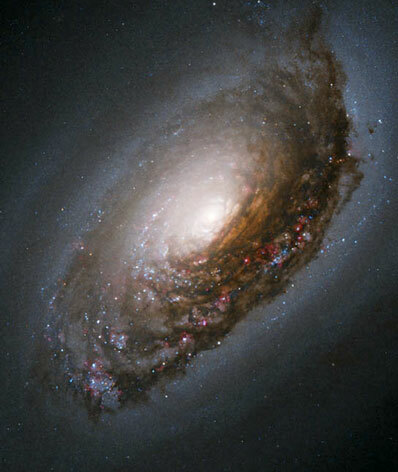 Located in the northern constellation Coma Berenices, M64 resides roughly 17 million light-years from Earth. This image of M64 was taken with Hubble's Wide Field Planetary Camera 2 (WFPC2) in 2001. The color image is a composite prepared by the Hubble Heritage Team from pictures taken through four different color filters. These filters isolate blue and near-infrared light, along with red light emitted by hydrogen atoms and green light from Str=F6mgren y.